This Pop! 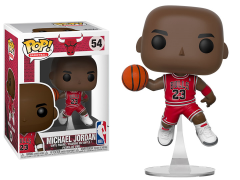 figure features Michael Jordan in a mid-air drive to the basket as he had done countless times in his career. The world recognized basketball player can count 15 seasons of professional basketball, six NBA Finals MVP Awards, ten scoring titles, five MVP awards as well as countless other accolades to his credit. Michael Jordan might be basketball royalty but all he needs is a comfortable shelf to rest his weary feet.